Proprietary Name: Pcxx Mocha Cappuccino Neutral Gl What is the Proprietary Name? Non-Proprietary Name: Sodium Fluoride What is the Non-Proprietary Name? 62007 - Ross Healthcare Inc.
Pcxx Mocha Cappuccino Neutral Gl with NDC 62007-829 is a a human prescription drug product labeled by Ross Healthcare Inc.. 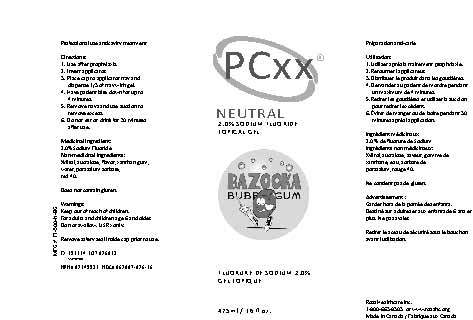 The generic name of Pcxx Mocha Cappuccino Neutral Gl is sodium fluoride. The product's dosage form is gel and is administered via dental; topical form. Labeler Name: Ross Healthcare Inc. Dental - Administration to a tooth or teeth. Marketing Category: UNAPPROVED DRUG OTHER - What is the Marketing Category? Start Marketing Date: 02-22-2019 What is the Start Marketing Date?